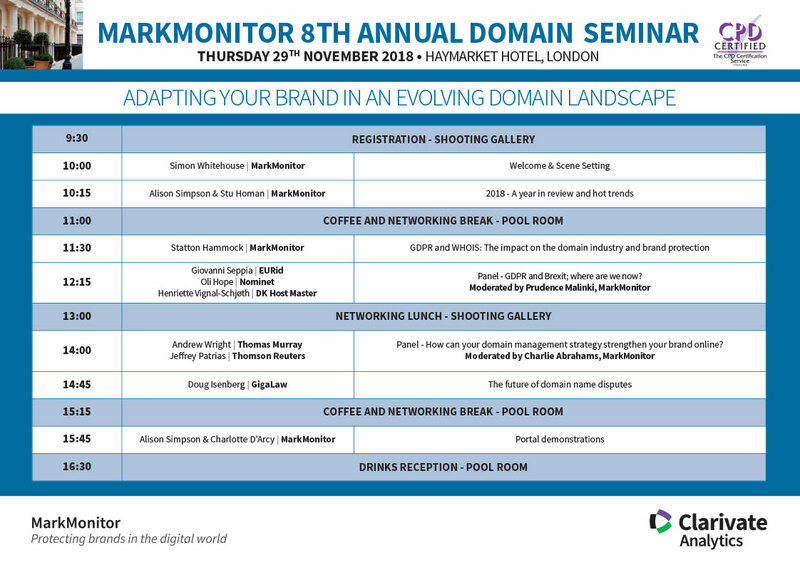 Whether you are new to domain management or looking to refresh and expand on your existing knowledge, our annual domain seminar is the event that brings together some of the industry’s leading experts to share their experiences and knowledge of the eco-system. The day will focus on how to keep your domain strategy simple but effective, demonstrating how the creation of an innovative and robust domain strategy needn't be a complex process. Jeff is Head of Brand Marketing for Thomson Reuters. He is responsible for corporate advertising, agency management, sponsorship, event management and branding. Within his brand responsibilities is brand operations and protection. This includes asset ownership of all domains and trademarks. Prior to joining Thomson Reuters, Jeff was a senior partner at The Lacek Group, a division of Ogilvy One. In his 11 years there he led the development of integrated relationship marketing programs for global clients. Jeff holds a bachelor's degree in International Business from the University of Minnesota, and is based in Baar, Switzerland. An attorney and founder of The GigaLaw Firm, Doug Isenberg is a recognized leader on Internet law; a domain name panelist; and a frequent author and speaker on Internet legal issues. He has worked with clients on domain name transactions and disputes since 1996 and today represents some of the world’s largest and best-known brands with respect to their Internet legal matters — including the largest complaint ever filed under the Uniform Domain Name Dispute Resolution Policy (UDRP). In addition to representing clients in domain name disputes, Doug also serves as a domain name panelist for the World Intellectual Property Organization (WIPO) in Geneva; The Forum (formerly the National Arbitration Forum) in Minneapolis; the Czech Arbitration Court (CAC) in Prague; and the British Columbia International Commercial Arbitration Centre (BCICAC) in Vancouver. Doug’s GigaLaw blog has been recognized by the ABA Journal as one of the top 100 best blogs for a legal audience and has earned a permanent place in The Expert Institute’s Best Legal Blog Hall of Fame. For more than 15 years, Statton has provided companies with strategic business advice and guidance on Internet policy, domain name strategy, compliance, and brand protection. As former general counsel and officer of several public, private, and non-profit corporations in the Internet industry including Network Solutions, Enom, Rightside, NameJet, and Name.com, Statton has led teams that have developed tactics, policies, procedures, and industry best practices to tackle several forms of abusive online behavior including consumer fraud, dissemination of counterfeit goods, illegal pharmacies, and trademark infringement. Statton's knowledge and contagious enthusiasm for the domain name industry has made him a sought after consultant by members of the United States Congress and a popular featured speaker at NamesCon, ICANN, INTA, and other domain name, cybersecurity, and counterfeit industry conferences. Statton holds a BA in Government from the University of Virginia and a JD from the University of Maine School of Law. Charlie Abrahams joined MarkMonitor in 2007 to build the company’s regional presence and to lead its EMEA operations which have grown substantially since then. Charlie started his career with major technology providers IBM and Unisys, and has spent the last fourteen years managing the entry into Europe of privately owned US solutions companies, including Plumtree Software and Network General. Since January 2014, Charlie has been responsible for MarkMonitor’s WorldWide Sales and supporting operations. In recent years Charlie has become an industry spokesperson on the growing topic of online brand protection, especially the sale of counterfeit goods and internet fraud and has regularly spoken as conferences such as “eCrime” in London, “the Global Secure Summit” in Vienna, “Securing the Pharma Supply Chain”, Amsterdam as well as appearing on BBC Breakfast News and Channel 4 News on the subject of the sale of counterfeit goods online. Charlie holds a degree in Economics and Sociology from Cambridge University. Oliver is the Director of Registry Services at Nominet, and has been for over 3 years. Nominet plays a critical role in the UK internet infrastructure - as guardian of the UK internet we provide a trusted online home for millions of British businesses. Our work touches on many areas ranging from enhanced internet security, to investment in social programmes that use the internet - via the Nominet Trust. In addition to playing a major role in facilitating the UK internet economy, we work closely with international organisations on issues including internet governance, and seek ways that we can help make the internet a more trusted space for everyone that uses it. Henriette is the Head of Legal at DK Hostmaster A/S – she has been there since Jan 2016. DK Hostmaster is the registry of the domain names '.dk' which can be localized in the DK zone on the internet's address system DNS. Andrew Wright is Director of Technology and Corporate Development at Thomas Murray, a financial services information, analytics and technology firm operating in the post-trade capital markets sector whose clients include many of the world’s largest banks and institutional investors. Andrew is also an Executive Director of Trayned Insight, a data science company serving the healthcare and pharmaceutical industries, and oversees technology and legal matters for Katharine Hamnett, a British fashion brand. The range of his experience has made him familiar with the technical, legal and commercial issues of brand management. Andrew has an MBA from the University of California, Los Angeles. With more than 14 years’ experience in the domain industry, Alison has managed all aspects of Corporate Domain Management, including domain strategy development and implementation. Alison started her career in the domain industry with MarkMonitor as a Client Services Manager responsible for managing large complex domain portfolios for global brands. Alison is currently responsible for the overall go-to-market message for MarkMonitor’s domain business and continues to work face-to-face with many MarkMonitor clients, providing industry insight and domain protection strategies. Stu is the Director of Domain Management at MarkMonitor. He is currently responsible for managing the Client Services and Operational elements of the Domain business including over 70 employees spread across the globe in Boise, London, and Tokyo. He provides leadership, direction, and expertise to drive the Domain business forward while nurturing key relationships with clients, industry partners, and peers. Stu is passionate about Domain portfolio strategy, data utilization, and galvanizing innovation at the organizational level. Stu holds a Bachelor of Science degree in Policy Analysis and Management from Cornell University. Currently working as a Global Relationship Manager at MarkMonitor, Prudence has vast experience in Domain Name and Portfolio Management. Giovanni is the External Relations Manager at EURid. EURid manages the .eu and .ею extension upon appointment by the European Commission. Country* -- Please Select -- United States Canada United Kingdom Denmark France Germany Italy Ireland Netherlands Spain Sweden Afghanistan Albania Algeria American Samoa Andorra Angola Anguilla Antarctica Antigua and Barbuda Argentina Armenia Aruba Australia Austria Azerbaijan Bahamas Bahrain Bangladesh Barbados Belarus Belgium Belize Benin Bermuda Bhutan Bolivia Bosnia and Herzegovina Botswana Bouvet Island Brazil British Indian Ocean Territory Brunei Darussalam Bulgaria Burkina Faso Burundi Cambodia Cameroon Cape Verde Cayman Islands Central African Republic Chad Chile China Christmas Island Cocos (Keeling) Islands Colombia Comoros Congo Cook Islands Costa Rica Cote d'Ivoire Croatia Cuba Cyprus Czech Republic Djibouti Dominica Dominican Republic East Timor Ecuador Egypt El Salvador Equatorial Guinea Eritrea Estonia Ethiopia Falkland Islands (Malvinas) Faroe Islands Fiji Finland French Guiana French Polynesia French Southern Territories Gabon Gambia Georgia Ghana Gibraltar Greece Greenland Grenada Guadeloupe Guam Guatemala Guinea Guinea-Bissau Guyana Haiti Heard Island and McDonald Isla... Holy See (Vatican City State) Honduras Hong Kong Hungary Iceland India Indonesia Iran Iraq Israel Jamaica Japan Jordan Kazakhstan Kazakstan Kenya Kiribati North Korea South Korea Kuwait Kyrgyzstan Lao People's Democratic Republ... Latvia Lebanon Lesotho Liberia Libya Liechtenstein Lithuania Luxembourg Macau Macedonia Madagascar Malawi Malaysia Maldives Mali Malta Marshall Islands Martinique Mauritania Mauritius Mayotte Mexico Micronesia Moldova Monaco Mongolia Montenegro Montserrat Morocco Mozambique Myanmar Namibia Nauru Nepal Netherlands Antilles New Caledonia New Zealand Nicaragua Niger Nigeria Niue Norfolk Island Northern Mariana Islands Norway Oman Pakistan Palau Palestinian Territory Panama Papua New Guinea Paraguay Peru Philippines Pitcairn Poland Portugal Puerto Rico Qatar Reunion Romania Russia Rwanda Saint Helena Saint Kitts and Nevis Saint Lucia Saint Pierre and Miquelon Saint Vincent and The Grenadin... Samoa San Marino Sao Tome and Principe Saudi Arabia Senegal Serbia and Montenegro Seychelles Sierra Leone Singapore Slovakia Slovenia Solomon Islands Somalia South Africa South Georgia and The South Sa... Sri lanka Sudan Suriname Svalbard and Jan Mayen Islands Swaziland Switzerland Syria Taiwan Tajikistan Tanzania Thailand Togo Tokelau Tonga Trinidad and Tobago Tunisia Turkey Turkmenistan Turks and Caicos Islands Tuvalu Uganda Ukraine United Arab Emirates United States Minor Outlying Islands Uruguay Uzbekistan Vanuatu Vatican Venezuela Vietnam British Virgin Islands US Virgin Islands Wallis and Futuna Western Sahara Yemen Yugoslavia Zambia Zimbabwe UAE UK USA Congo, The Democratic Republic... Iran, Islamic Republic of Korea, Democratic People's Rep... Korea, Republic of Libyan Arab Jamahiriya Macedonia, The Former Yugoslav... Micronesia, Federated States o... Moldova, Republic of Palestinian Territory, Occupie... Russian Federation Svalbard and Jan Mayen Syrian Arab Republic Tanzania, United Republic of Virgin Islands, British Virgin Islands, U.S.